Slow labor force growth will lead to higher labor costs. 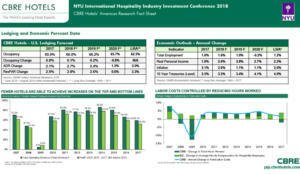 NEW YORK—CBRE Hotels’ Americas Research provided its current thinking and outlook for the U.S. lodging industry at this year’s NYU International Hospitality Industry Investment Conference. Economic Recession: Recent readings from the Bureau of Economic Analysis reveal that the U.S. economy continues to expand at an attractive, albeit average, pace. Economists at CBRE Econometric Advisors do expect a slowing down of the economy in 2020, but a technical recession does not seem to be in the cards. High Energy Costs: While elevated levels of unrest in some of the oil-producing areas of the world and an upward trending U.S. dollar in Q2 2018 have caused world oil prices to rise, they remain well below the historical levels ($125 per barrel) that threaten lodging demand. Bubbles: Significant academic research focused on identifying the presence of bubbles in the economy reveals that you only know when you are in a bubble when it bursts. CBRE provided its current thinking and outlook for the U.S. lodging industry. Overbuilding: Net annual supply change nationally was 1.8% in 2017 according to STR Inc.—exactly equal to the STR long run average dating back to 1987. This amount is forecast to peak at 2% in 2018, and to remain roughly at this level through 2022 based on the June-August 2018 Hotel Horizons report. This level is well below the previous cyclical peak of 3.1% in Q1 2009. Black Swan Event: Two catastrophic events since the turn of the century—the terrorist attacks of September 11, 2001 and the Great Recession of 2008—both illustrated that dramatic declines in lodging performance are realized very quickly, and severely, when extraordinary, unanticipated actions such as these occur. There are many reasons to hope that nothing like this happens again. 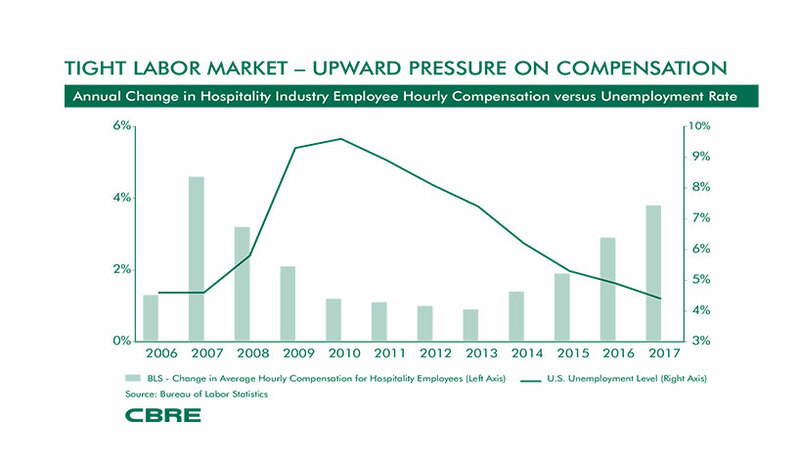 While the fundamentals are sound and portend a continued, protracted period of topline revenue growth, the expanding scarcity of labor in many markets around the country threatens commensurate levels of profit increases. Labor and related expenses in the trends sample represented 42.4% of total expenses this past year. While managers were able to limit the year-over-year gain to 1.8% in 2017, this ability will likely be short lived as the unemployment rate continues to decline. These conditions are made worse by the laggard increases in the domestic labor force. Slow labor force growth is a result, in part, of decelerating growth of the civilian population, which the Bureau of Labor Statistics projects to grow at an annual rate of 0.9% from 2016 to 2026. This growth is slower than the rates witnessed during previous decades, 1% from 2006 to 2016, and 1.3% from 1996 to 2006. Further, about nine out of 10 new jobs are projected to be added in the service-providing sector (including leisure and hospitality) from 2016 to 2026, resulting in more than 10.5 million new jobs, or 0.8% annual growth. Conversely, the goods-producing sector is expected to increase by only 219,000 jobs, growing at a rate of 0.1% per year over the projections decade. “We expect that managing increases in labor and related expenses, combined with proactive efforts focused on enhanced productivity, will be an operator headline issue for many years to come,” he said.